One of the themes of this blog is that running will make better people out of us. I would like to share the stories of two exemplary runners it has been my privilege to know, train and compete with. 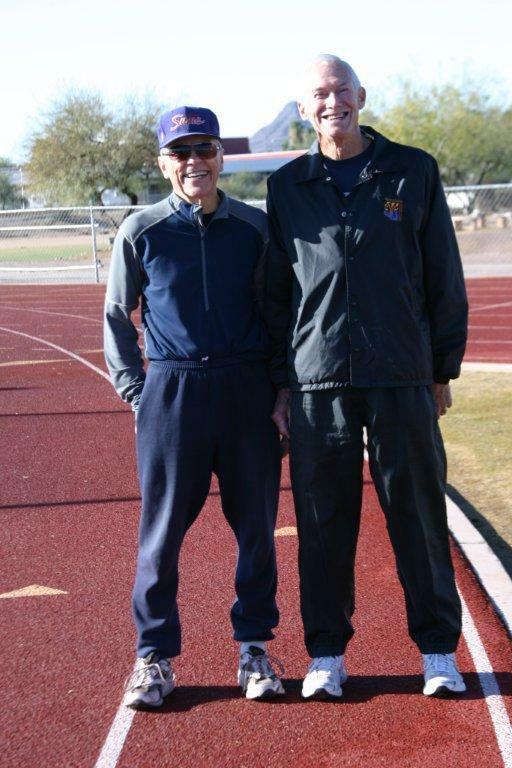 Over the years, the Arizona Senior Olympics along with the Arizona Masters Track & Field venues have crowned many state champions and ushered through many potential National and World champions. Rarely, however, have we had two Hall of Fame Athletes step onto the same track to contest the same event. 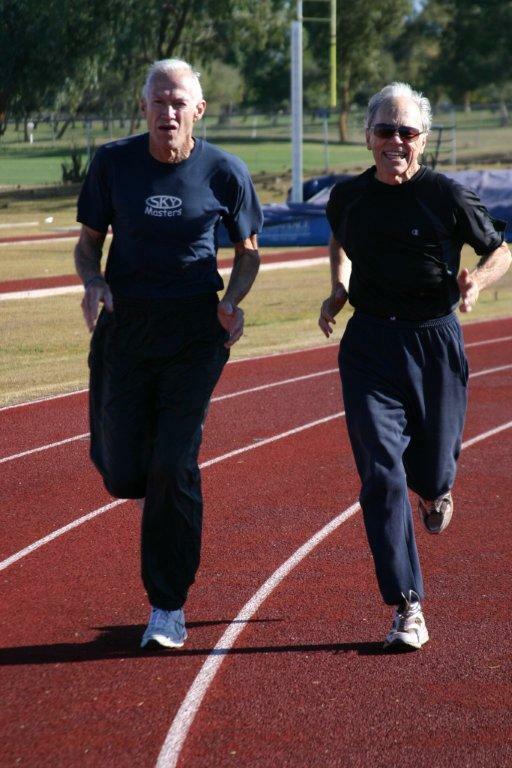 Enter Jack Rickard (75-79 age group) and Dave Doerrer (70-74 age group). Although competing in different age groups, these two luminaries are set to toe the line for glory in the gruelling 400-meter run. Like many older athletes of their ilk they each bring to the line stories of dedication to their sport, laudatory professional lives, and significant contributions to their fellow man. Dave Gold medal winner at the USA Masters Track & Field Championships in both the 400-meter hurdles and the decathlon. RFYL: You both have so many accomplishments. Name one you are proud of. Jack My sprint medley relay team set a national small college record ath the Kansas University Relays. RFYL: What made you decide to be a runner? Dave In 7th and 8th grade I was better at the warm up laps we ran before basketball pratice than I was at playing basketball. Darn! I still think playing basketball is more fun than just running. RFYL: Who had the most influence on your running? Jack Andy Hornbaker in high school, my friend who was a senior state miler when I was a freshman. He took time to run with me and to give constant encouragement. Unusual for a senior to do that with a freshman. RFYL:You have both dedicated your lives to education Can you share some of your experiences with young peopl? Jack One of the highest compliments I ever recieved came from Dr Jeff Messer, the girl’s cross country coach at Xavier (three state championships in a row) who told me that I was an inspiration to the girls. We had been running on the same Central High track at 5 am each morning for workouts whn the girls were not running the canals. Dave I’ve coached a lot of great kids, some with outstanding talent. Helping them develop personally and athletically has been very rewarding. One of my student athletes even coached our Olympic track team! RFYL: What makes a successful runner? Jack With running you have to be self-motivated. It is very important to set goals, maybe more important as you grow older. It helps to have work-out partners when you can. It is also very important to take time off to heal an injury and not run through it like saome runners are inclined to do. RFYL: What advice do you have for remaining healthy after age 70? Jack Good diet, strong training program. And keeping a positive mental attitude to combat the frustrations of aging. Setting goals is also very important. Dave Good nutrition, fellowship, setting goals, and light beer. RFYL: Setting goals seems to be a theme with both of you. What are your goals for the future? Dave Spend more time creating memories for/with my wife Marge and my 11 grand kids! RFYL: When will you hang up the spikes? Jack To paraphrase Yossarian in Catch-22, I’m going to run forever or die trying. RFYL: For those who may not know, what is it like running a 400 meter race? Dave I used to say run until you get tired then gut it out for the final 100 meters. Now when I get tired I’m only half way through. Jack It’s like deliberately making yourself throw up. Only those people who have a thing about self-punishment and pain run that race. RFYL: I did ask both Jack and Dave if they would like to run the NYCMarathon with me. They declined. As our elder statesman in the pursuit of a healthy lifestyle we will give Jack the last word. I consider running to be my lifelong endeavour. I don’t ever intend to stop. I’m continually amazed how the human body adapts and how one can gain physical strength at any age. The benefits of physical activity are well documented. Life is a Joy. We celebrate it by running.